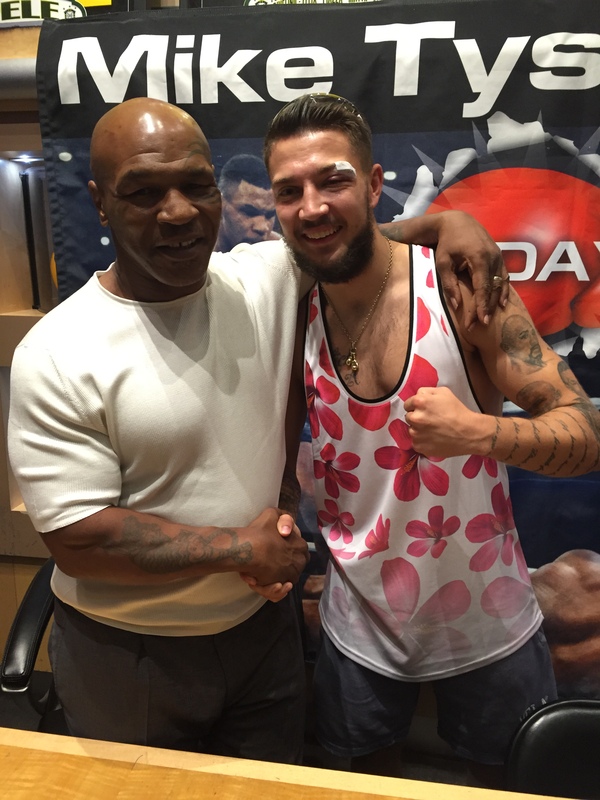 Meeting some of his all-time fighting heroes in Las Vegas after his victory against former K-1 Max Champion Murthel ‘The Predator’ Groenhart was the icing on the cake for Nottingham’s Chad ‘2 Slick’ Sugden last weekend. 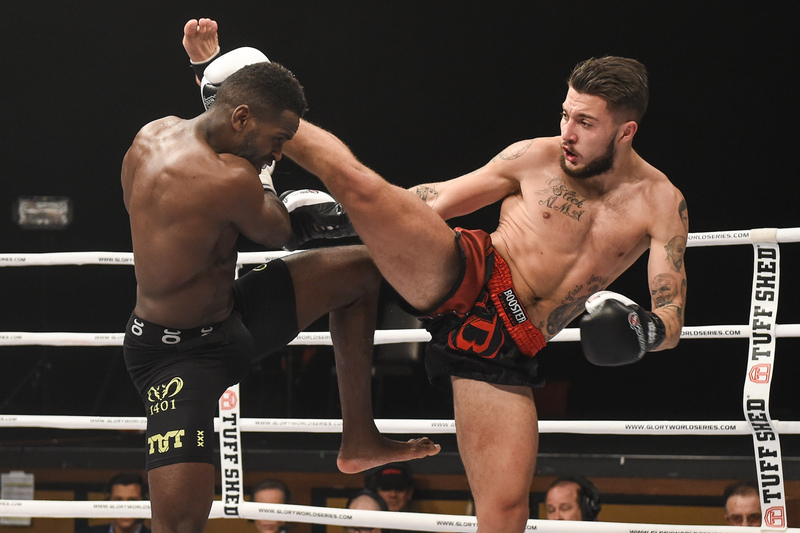 In a clash which many thought had the makings of the fight of the night, the Suggy’s Gym 21 year-old defeated the Dutch-Surinamese veteran of over 60 pro fights on the card of the GLORY 23 Superfight Series at the Hard Rock Hotel on Friday 7 August. Several thousand Glory World Series fans were in the fight capital of the world, including Floyd Mayweather Junior, with UFC Bantamweight champion T J Dillishaw, Urijah Faber and Nick Diaz among the crowd on the night. In the run-up to the fight, Chad’s usual six-week training camp at Suggy’s Gym had been supplemented by regular trips to 4th Dimension in Nottingham and sparring along with younger brother Bailey at Hemmers Gym in Holland. After an action-packed undercard, Chad went into his fight as the acknowledged underdog against an opponent known for his devastating knockout power. The first round started quite slowly, with both fighters showing caution and Chad taking the time to look at Murthel. Following instructions from the Suggy’s Gym corner to push and press more and take advantage of his opponent’s missing, a calculated second round could have gone either way. But Chad and his camp believed they were gaining momentum and felt that they had edged the round with the more effective striking. In the third, the instructions for Chad were simple – to take it big and win every exchange, going all out to try and hurt his opponent. The action was fast and furious with Chad looking as if he was enjoying the round, landing kicks and knees as well as out-boxing Murthel. Then, with 30 seconds to go in the round, Murthel went down after Chad landed a jumping knee, which should certainly have been a count for Murthel as he failed to recover and show willing to fight on. Instead he turned to the referee and suggested a clash of heads. The clash of heads that had split Chad’s eye was earlier in the round and not connected to the legitimate knee which sent Murthel reeling to the canvas holding his head. 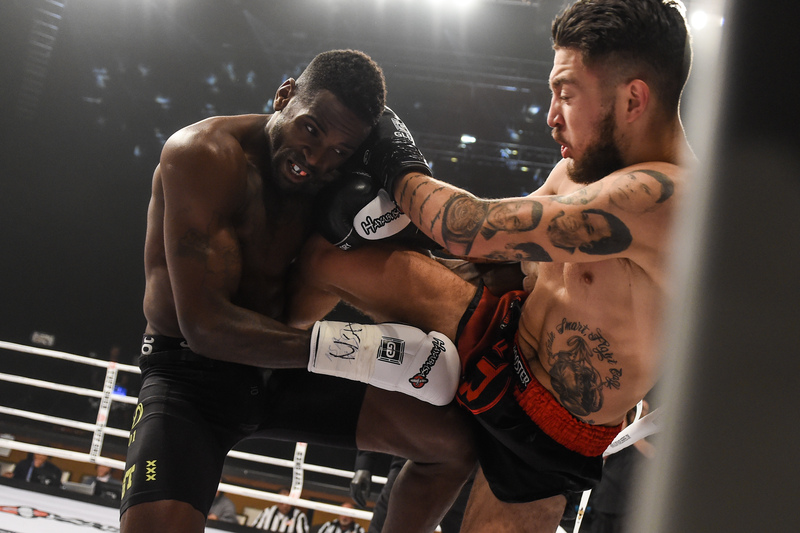 “Suggy’s Gym is becoming widely known on the global stage and Chad’s reputation as a world class fighter continues to grow as he picks up experience both at home and abroad on some of the biggest promotions,” added Dean. “We set very high standards for him because we know what he’s capable of. 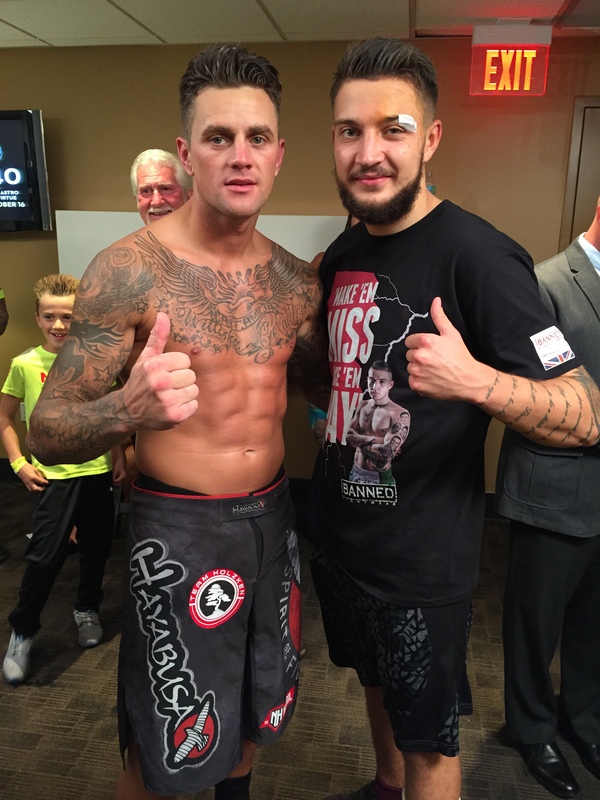 That said, outside of Nieky Holzken who won the headline fight on the night to take the Glory Welterweight title, we believe Murthel is the most dangerous and unpredictable fighter in this division. “But Chad has the evasive skills and broken rhythm which are so difficult for opponents to pick up on and did very well to maintain his composure after the accidental clash of heads left him with a bad cut to his eye. Back in the UK on Monday, Chad was still buzzing after what he called the experience of a lifetime. “I went to Vegas to win and did exactly what I said I was going to do. 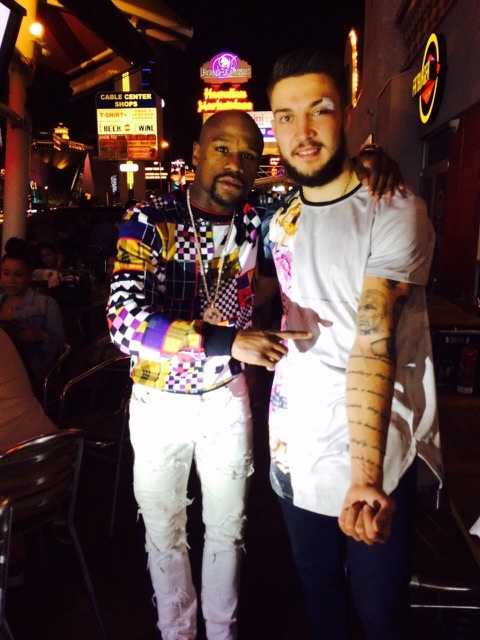 Not only that but I got to meet some fans who’d travelled from several states across America just to see me fight. And as if that wasn’t enough, I met my boxing idol Floyd Mayweather, along with T J Dillishaw, Urijah Faber and Nick Diaz who were ringside at the Hard Rock Hotel. Looking to the future, Dean said: “I still think we haven’t seen the best in Chad yet, which is quite a scary thought. His boxing skills are those of a high level professional boxer and at 21 he’s just achieved one up on Carl Froch by realising his dream of fighting in Las Vegas. Previous Post Ready to rumble!